Lincoln delivering one of the immortal speeches of human history--the Gettysburg Address on November 19, 1863. Few if any individuals during the course of American history have been written about more than Abraham Lincoln. His life was shrouded in mystique, his every action or judgment placed under a microscope, and there is an everlasting examination to understand the man that is scrutinized to this day. A mere man transformed by the volatilizing events of the period into a timeless greatness, he is a transcendent figure in history by whose words and actions continue to resonate in the American conscience today. In fact, this impact is both compelling and controversial---Lincoln, although overwhelmingly revered in recorded history, is not without his detractors. It could also be said that Lincoln is a paradox in commemoration--- memorialized in statues, consecrated by his own words and the stamp of history. Yet there coexists a persona of homespun simplicity analogized in the form and the humility of a copper penny. Writing about the life and death of Abraham Lincoln is an exercise in redundancy if not futility. It is a subject one hundred and fifty years in the making imprinted in newspapers, magazines, and among the great written works of history. Authors through the course of time have been successful introducing something "new" about his life previously unpublished but only by intensive research or the fateful hand of luck. Essentially, every written volume about him reintroduces the known facts or events--the differences are in the writing prowess of the author or perhaps examining the established knowledge from another perspective. The only unfulfilled period of Lincoln's life in great detail is his early years and unless by a phenomenal discovery, will remain as such. The story of Lincoln in death is as compelling as his life presiding over a divided nation during the Civil War. It was a presidency incomplete by virtue of his death that resulted in a vacuum during the critical post war period. His intent was to heal the wounds of carnage with malice towards none and begin the process of reuniting North and South. Without question, it was task on a tantamount scale regardless of who occupied the White House but historians generally agree had Lincoln lived to complete his second term into 1869, the transition would have yielded a different history. 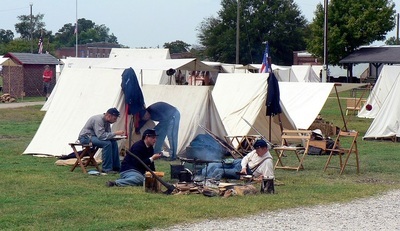 Instead, a radical element engulfed Washington awash in bitterness and vengeance towards the South that shaped the Reconstruction years. Its scars would last for decades--some will suggest ones that linger to this day. But the purpose of this piece is not to analyze the life of Lincoln, the events of the Civil War, nor the political and social implications of his time that shaped the post war nation. There are innumerable volumes written through the ages that recount and explore these elements in great detail. Any attempt to do so here would be academic if not farce. The accord of the Lincoln funeral is covered thoroughly in the annals of written history; therefore, a detailed timeline of events here would be moot. 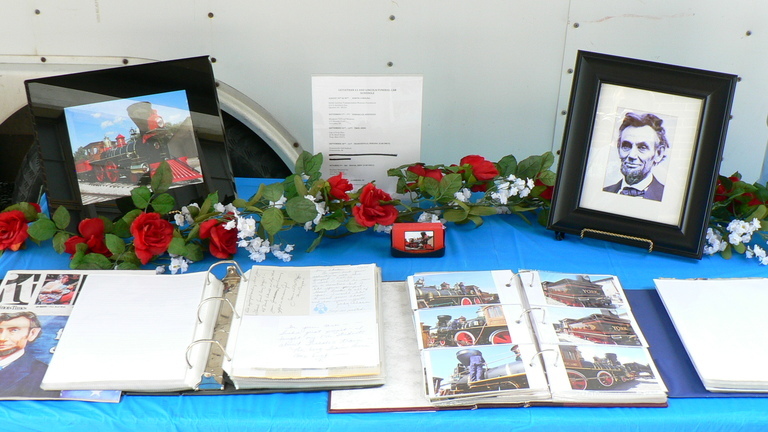 Included on this page is a brief recap of the actual funeral train noting its route, dates of stops, and a sampling of archival photos taken at various locations along its course. 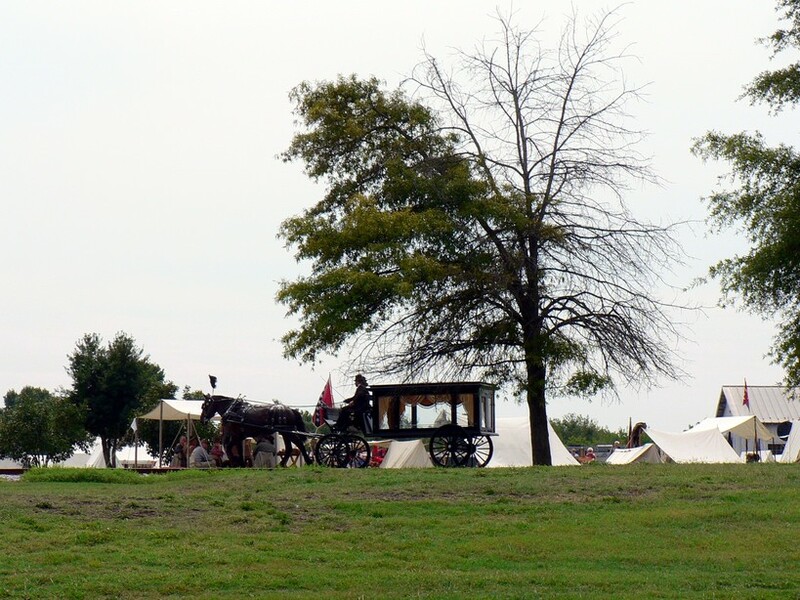 The farewell journey of a martyred Abraham Lincoln from Washington to Springfield, Illinois was an event on a scale not seen before---or since. Rooted in a commiserate North--and even South to an extent---the grief of a nation combined with established technologies made it possible. Continued improvements in the North such as the expansion of the telegraph and a broadening railroad network, proven beyond doubt by the calamity of war, shrank the distances and communicated to the populace its itinerary. Another development of lesser notoriety was the technique of widespread embalming. 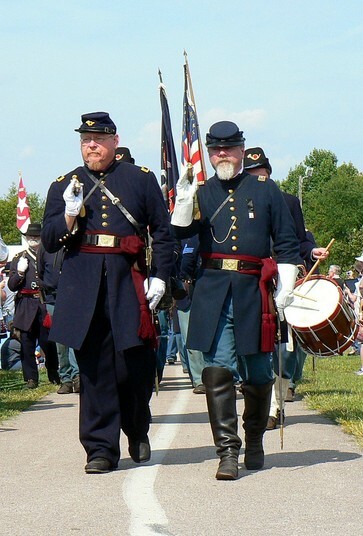 During the war, soldiers could be sent home to families for interment instead of battlefield burial although this was usually available for only the affluent. 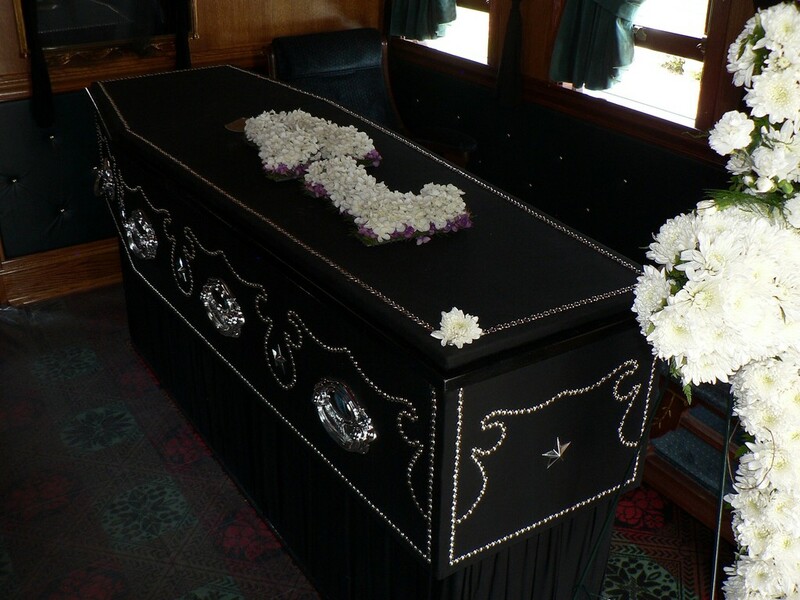 In the case of President Lincoln, embalming ensured that his body would remain preserved throughout the journey for viewing. After the death of the President, Mary Lincoln's intended wish was for her husband to be taken directly to Springfield for burial. Finally succumbing to the wishes of others, she agreed to the procession of a funeral train to effectively retrace his route four years earlier when he assumed office on the eve of war. There was certainly political influence behind the selection of this route also. It included nearly all the major population centers in the North and numerous respectable sized cities in between. 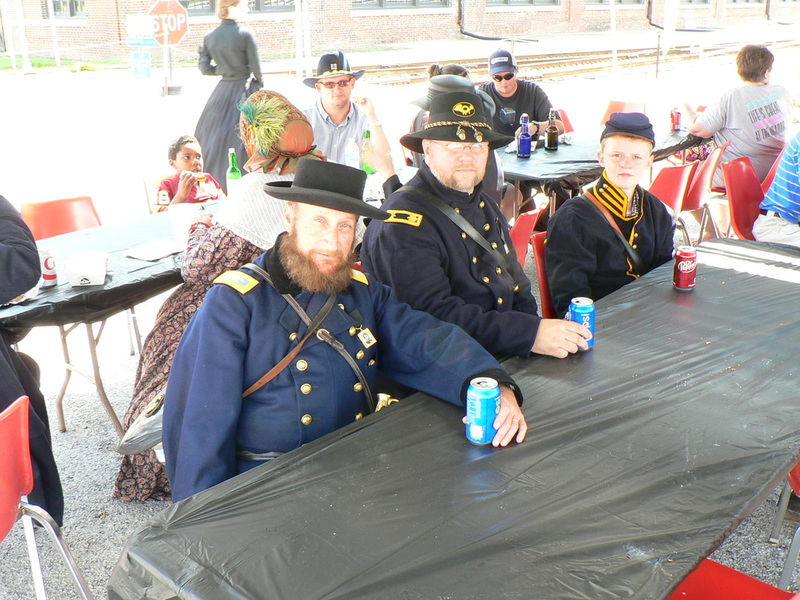 Although giving her consent, Mary Lincoln did not partake. So deep was her mourning that she did not attend the funeral in Washington and did not leave the city until her husband was interred at Springfield. President Lincoln was not the only member of the family who would make the long roundabout journey to Springfield. Traveling with him was his son Willie (William) who had died in 1862 from typhoid fever. The Lincolns had chosen to inter Willie in Washington while occupying the White House but he was exhumed during the week following his father's death. 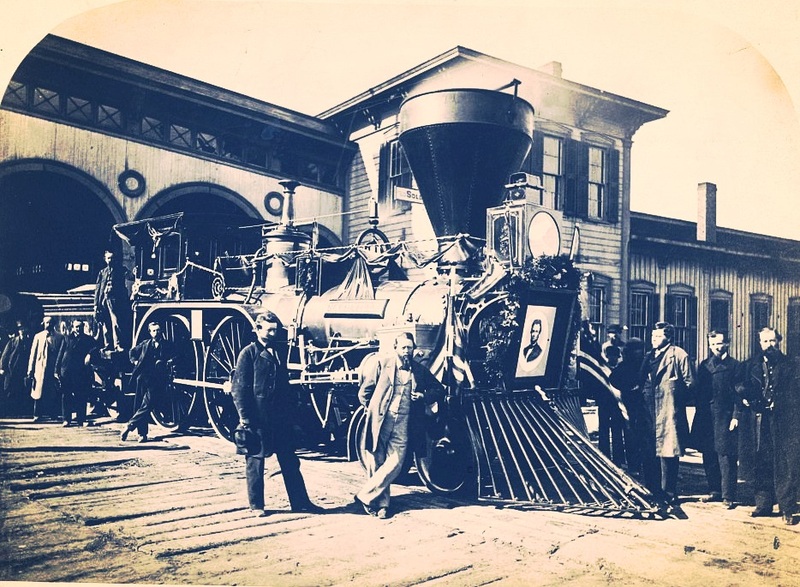 As the funeral train passed through the North and the body of the President was seen by hundreds of thousands in the major cities, the casket that held Willie remained on the train in deliberate obscurity. As the week of mourning in Washington, DC drew to a conclusion, it was time for the city to bid farewell to the fallen President. 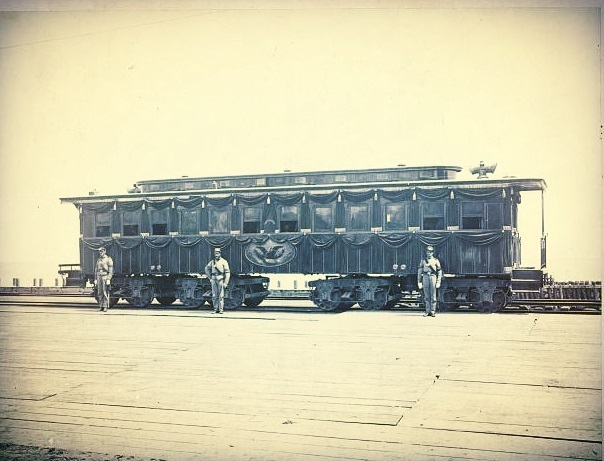 On April 21, 1865, one week after the tragic night at Ford's Theater, the bodies of Abraham and William Lincoln were placed into his private railroad car which was now decorated as a funeral memorial. Accompanying the train were 300 dignitaries one of whom was the President's eldest son, Robert, who would remain only to the stop at Baltimore. 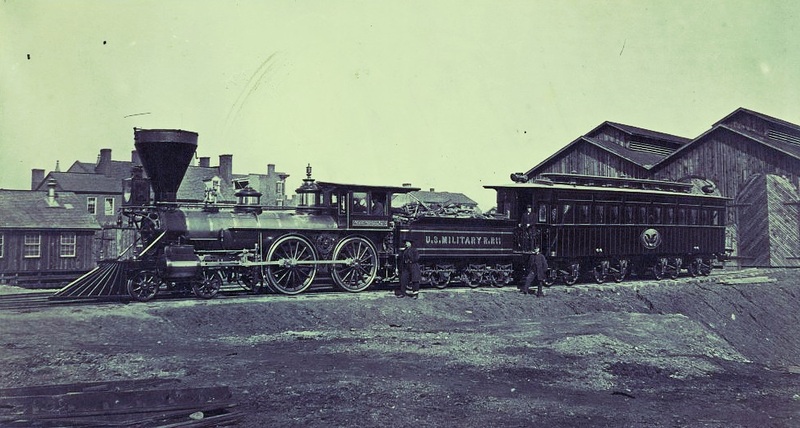 From here the train, named the Lincoln Special and under control of the military, would proceed on a 1654 mile journey passing through seven states and 180 cities in addition to smaller towns. 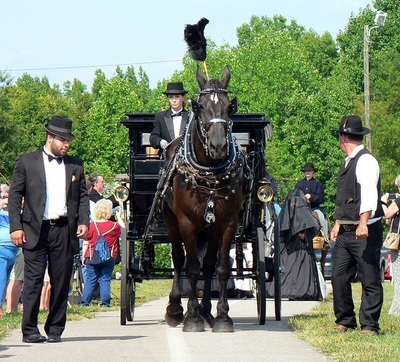 The President's body would ride in elegant processions in the larger cities and be viewed by hundreds of thousands in state memorials. As the train plied along its route, mourners in rural communities lined the railroad awaiting the passage of the funeral train at all hours of day and night. It is estimated that seven million Americans paid respect to Lincoln's farewell during the two week journey from Washington to Springfield. Finally, on May 4, 1865, it was over. Abraham Lincoln was home, laid to rest in Springfield, but his passage into immortality had just begun. A John Carroll Power map tracing Lincoln's journeys---his early life from Kentucky to Illinois, the inaugural route to Washington in 1861 and the return four years later (in black) to Springfield of his funeral train. The inaugural route included the cities of Cincinnati and Pittsburgh but was not retraced by the funeral train. 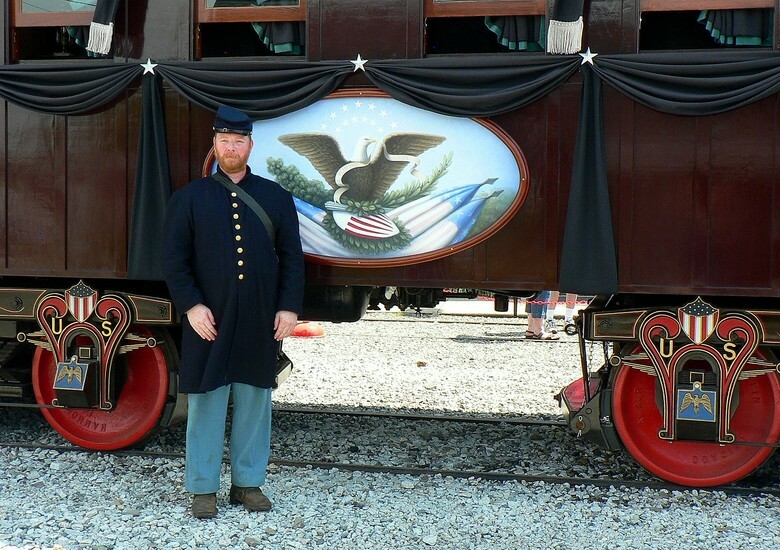 Chicago was not on the 1861 inaugural route but added as a major stop on the funeral train. 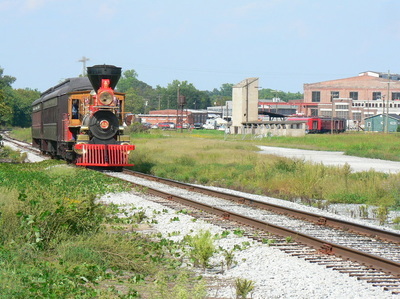 It is a common misconception that the Lincoln Special made the journey from Washington to Springfield with a single locomotive. In reality, there was a total of forty-two. 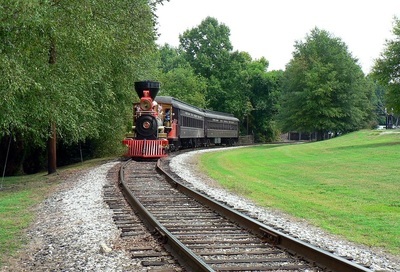 As the train moved on to different railroads, each supplied its own power and depending on the length of the run for that respective road, locomotives were changed. Each railroad along the route wanted its power and name associated with this unprecedented historic event. 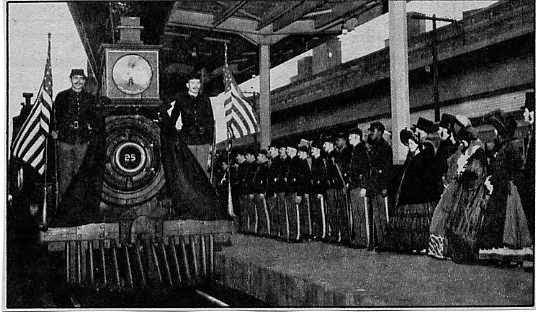 In addition, pilot trains were used that ran in advance of the actual funeral train by 10 to 15 minutes. 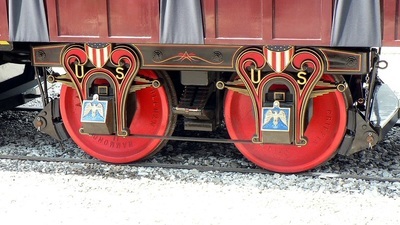 These simultaneously announced the coming of the Lincoln Special were insurance against any unforeseen track problems or obstacles. 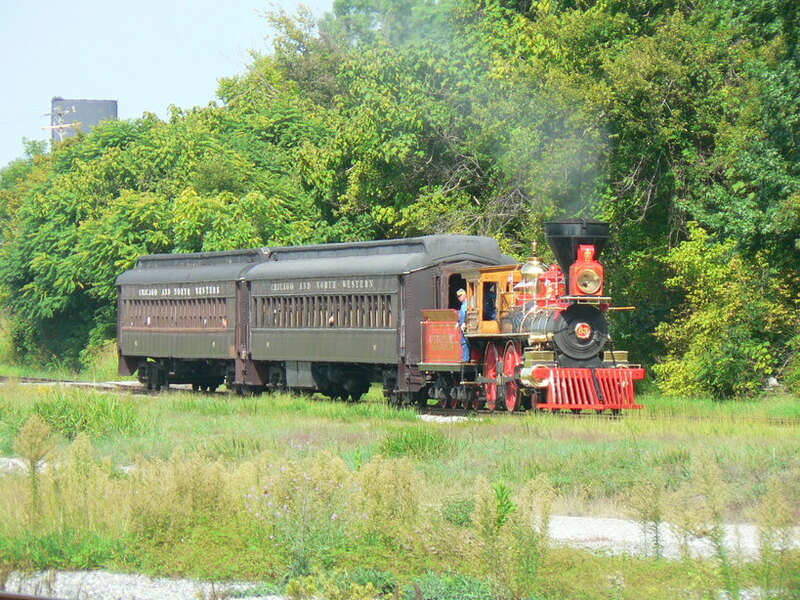 Once the train entered Illinois, three pilot trains ran in advance and on the final leg of the journey to Springfield, the number increased to five. 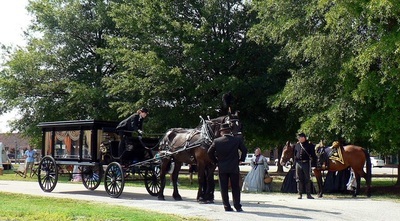 The images below are randomly selected of both the trains and funeral scenes at different locations. All of these images are in the common domain and can be found on a multitude of historical pages and blogs devoted to the topic. Unless any images of the funeral train are declared as privately owned, copyrights are expired on all due to their age. 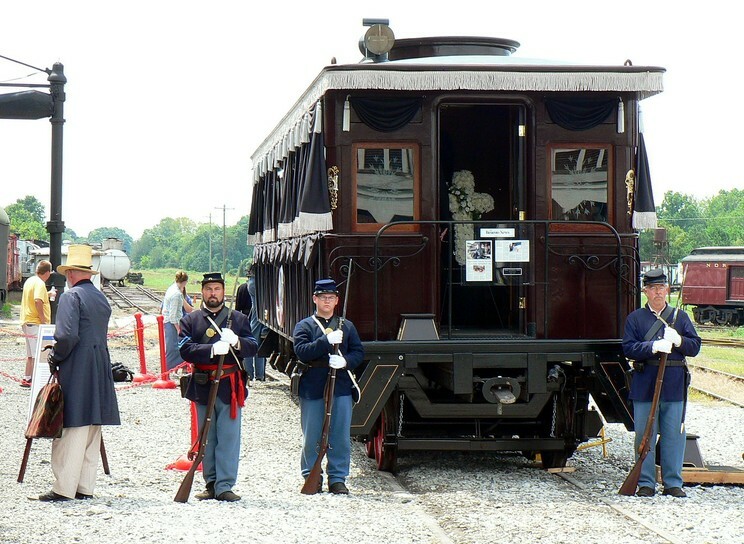 April 21, 1865: Funeral train departs Washington on the Baltimore and Ohio Railroad at 8:00 AM bound for Baltimore. Traveling a distance of 38 miles, it arrives at 10:00 AM. Departs Baltimore at 3:00 PM on the Northern Central Railway en route to Harrisburg, Pennsylvania. It takes five hours to traverse the 58 mile segment with the train arriving at 8:00 PM. 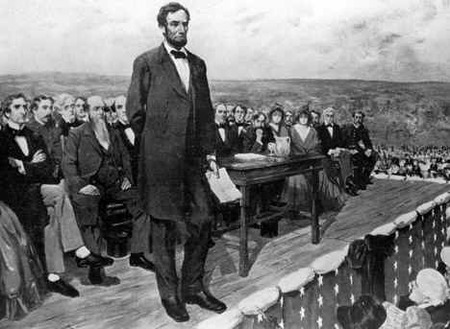 Lincoln had previously taken this route two years earlier to deliver a speech at a small town named Gettysburg. April 22, 1865: Departure from Harrisburg occurs at 11:15 AM. 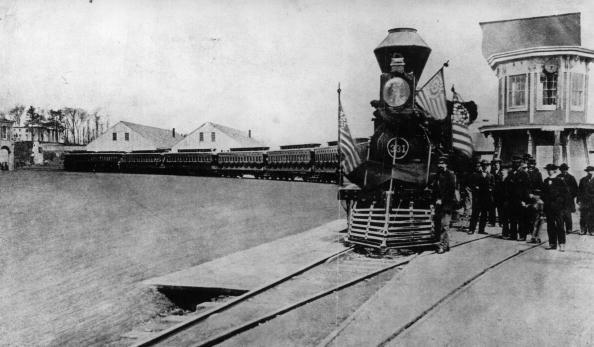 The train embarks on a 106 mile trip over the Pennsylvania Railroad to Philadelphia. Time of arrival is recorded at 4:30 PM. 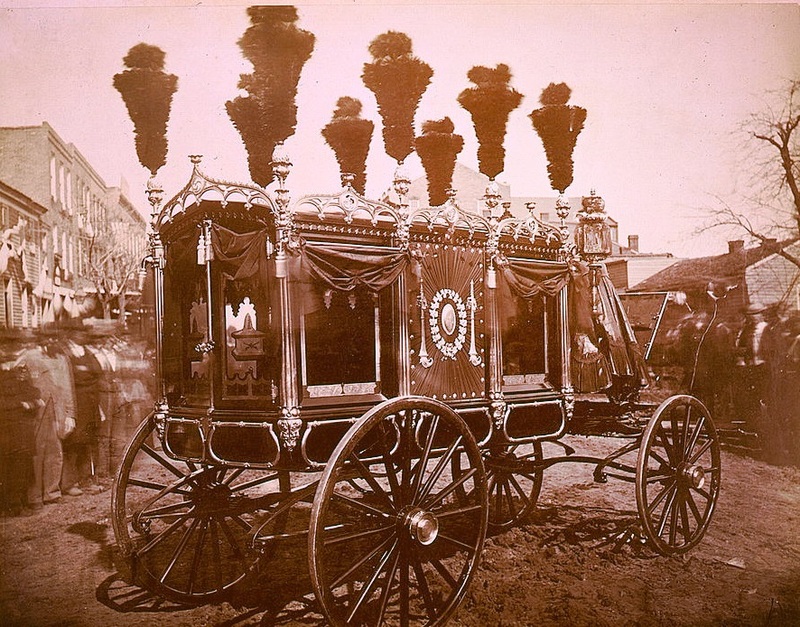 April 23, 1865: President Lincoln’s body remains in Philadelphia for mass viewings. April 24, 1865: Funeral train departs Philadelphia at 4:00 AM for New York. On its 86 mile route, it passes through New Jersey and terminates at Jersey City at 10:00 AM. 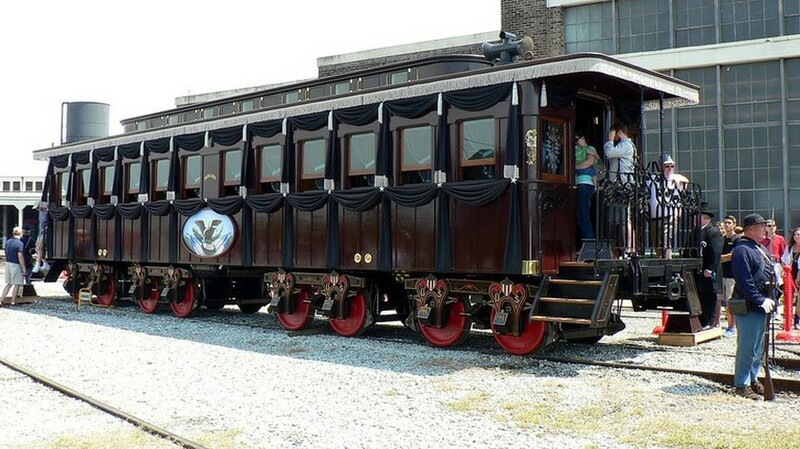 President Lincoln’s funeral car is cut from the train then ferried across the Hudson River. 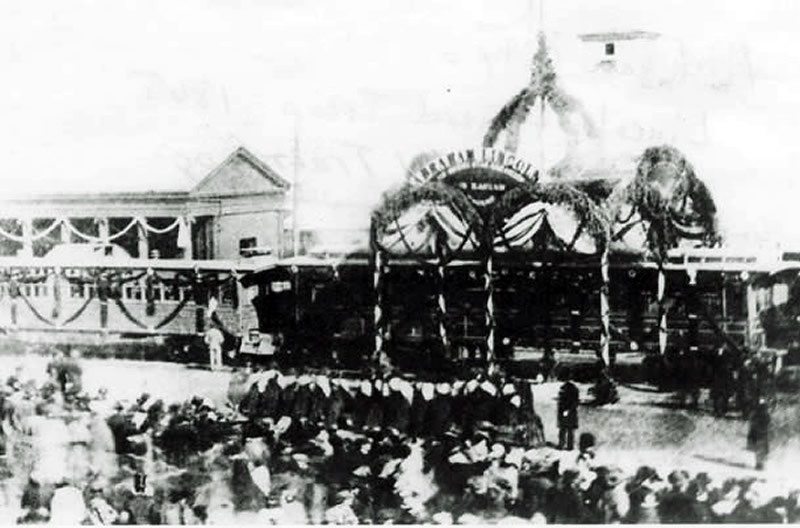 Lincoln's coffin is taken to City Hall in New York. April 25, 1865: At 2:00PM, a magnificent funeral procession takes place in New York which is witnessed by future President Theodore Roosevelt. 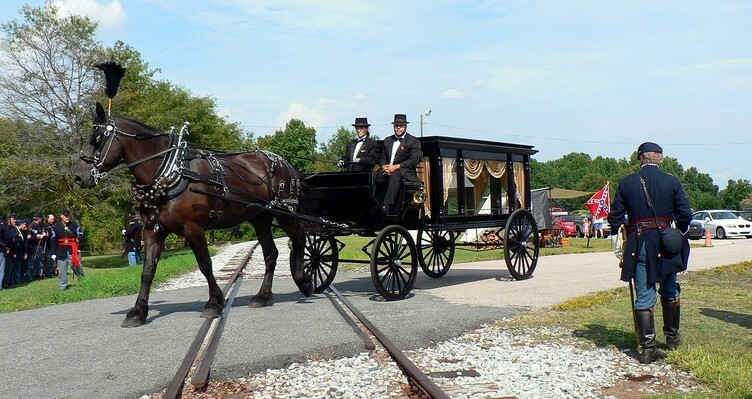 Shortly after 4:00 PM, the funeral train departs New York bound for the state capital at Albany. Arriving at Rensselaer at 10:55 PM along the banks of the Hudson, the casket is removed and ferried across the river to the state capital building at Albany. 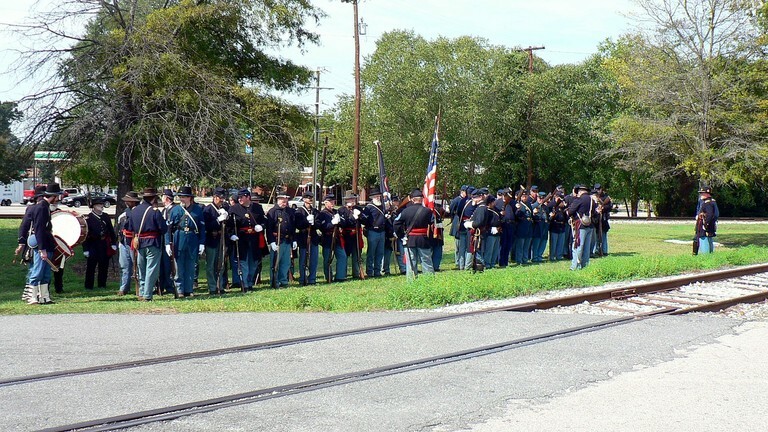 April 26, 1865: A grand procession takes place in Albany. Later, at 4:00 PM, the train departs Albany on a 113 mile trek over the New York Central Railroad to Buffalo. 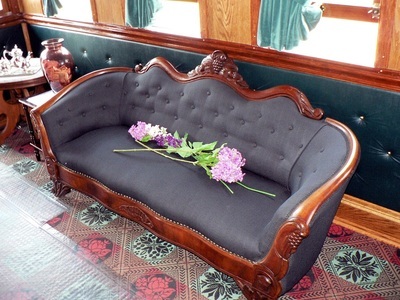 April 27, 1865: Funeral train arrives in Buffalo at 7:00 AM. 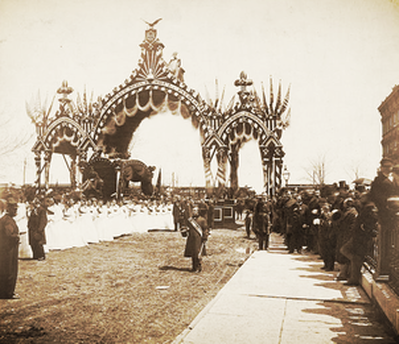 Lincoln’s casket is taken to St. James Hall where former President Millard Fillmore and future President Grover Cleveland were among the viewers. Train departs Buffalo for Cleveland, OH on a 183 mile trip that continues over the New York Central. April 28, 1865: During a brief stop at Westfield, New York, five women adorn the President’s coffin with a cross of flowers. The train continues its westward trip arriving in Cleveland at 7:00 AM. The train remains here and Lincoln’s coffin is placed on display at Monument Square for public viewing. April 29, 1865: At midnight, train departs on the 135 mile trip to Columbus via the Cleveland, Columbus, and Cincinnati Railway. The Lincoln Special arrives in Columbus at 7:30 AM and taken to the state capital building for viewing. Departure is at 8:00 PM as the train continues to Indianapolis 187 miles away. April 30, 1865: The Lincoln Special pulls into the station at Indianapolis at 7:00 AM. 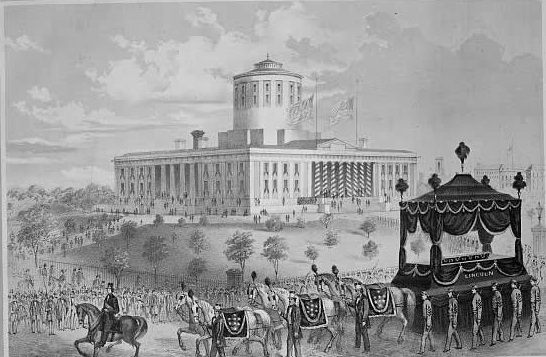 From here, the President’s coffin was taken to the Indiana State House. A procession was planned here but heavy rains led to its cancellation limiting the stop in the Indiana capital to viewing only. Train departs on the 210 mile run to Chicago late that evening. 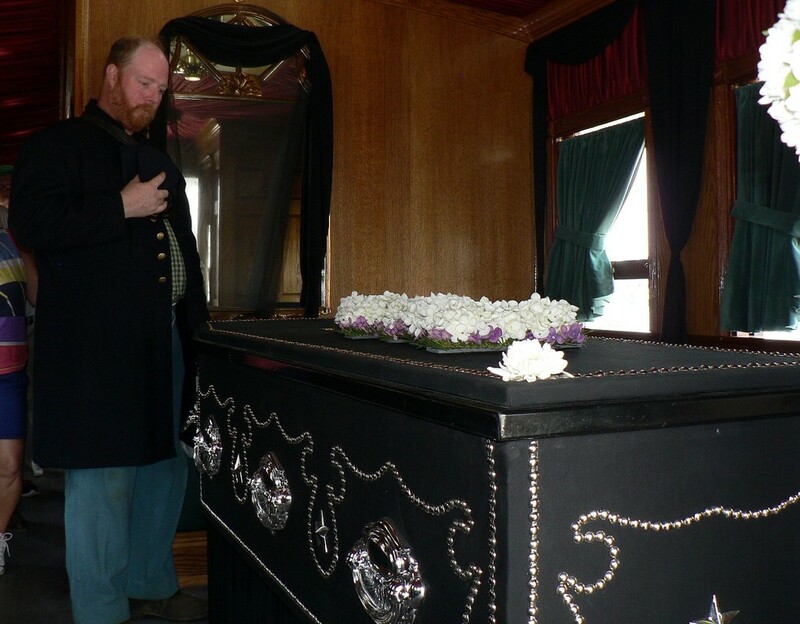 May 1, 1865: En route to Chicago, the train briefly stopped in Michigan City, Indiana for an impromptu funeral. 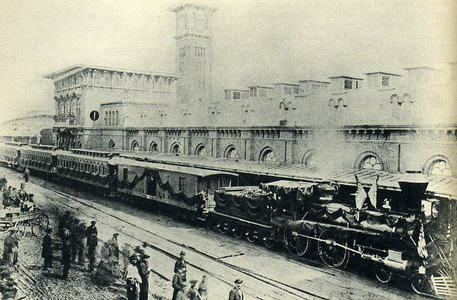 Arrival in Chicago was at 11:00 AM with the train stopping on a trestle on Lake Michigan instead of Union Station. A large procession was conducted in the Windy City terminating at Cook County Court House. Public viewing continued through the remainder of the evening. May 2, 1865: Public viewing continues throughout the day until 8:00 PM. The coffin was then taken to the St. Louis and Alton Railroad depot for departure to Springfield, Illinois. 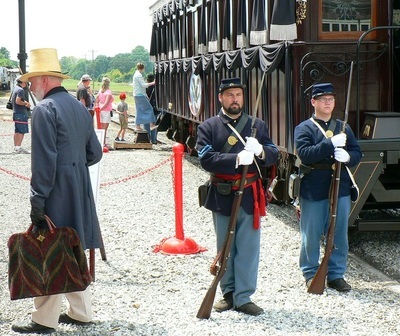 Embarking on the final leg of its journey, the train was now traveling the final 184 miles of its journey to where Abraham Lincoln’s presidential journey began four years earlier. May 3, 1865: The train arrived at the Chicago and Alton depot in the early morning at Springfield. The President’s coffin was taken to the Hall of Representatives in the capital building and by 10:00 AM, began receiving mourners. 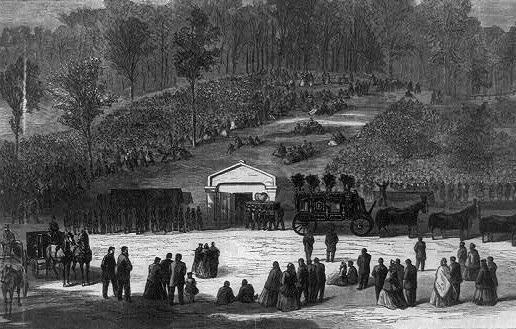 May 4, 1865: The last day of President Lincoln’s funeral journey from Washington to Springfield began with a final preparation for burial. The coffin was loaded in an elegant hearse provided by the city of St. Louis and the procession began moving through town passing Lincoln’s home and other prominent locations. The final destination was to the tomb at Oak Ridge Cemetery where the President and his son Willie were laid to rest. The two week farewell of Abraham Lincoln from Washington to Springfield would prove to be only one journey his earthly remains would take in death. 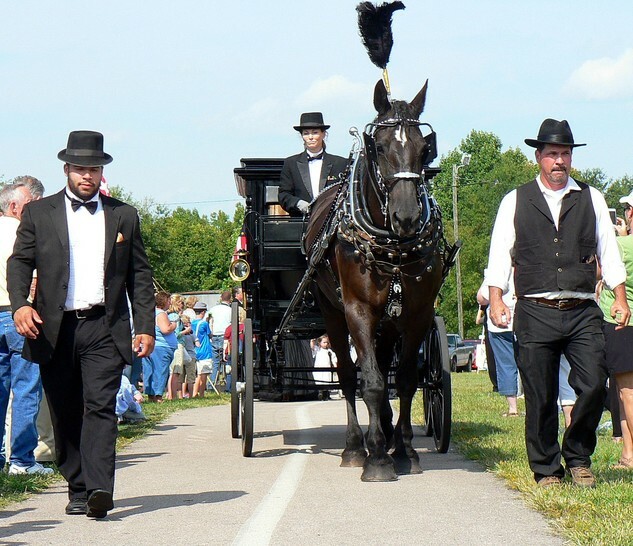 The subsequent years would witness seventeen moves and an attempted theft of his body before it was permanently---and securely—laid to rest in 1901. The details of this nomadic account are entirely another story of and to itself. 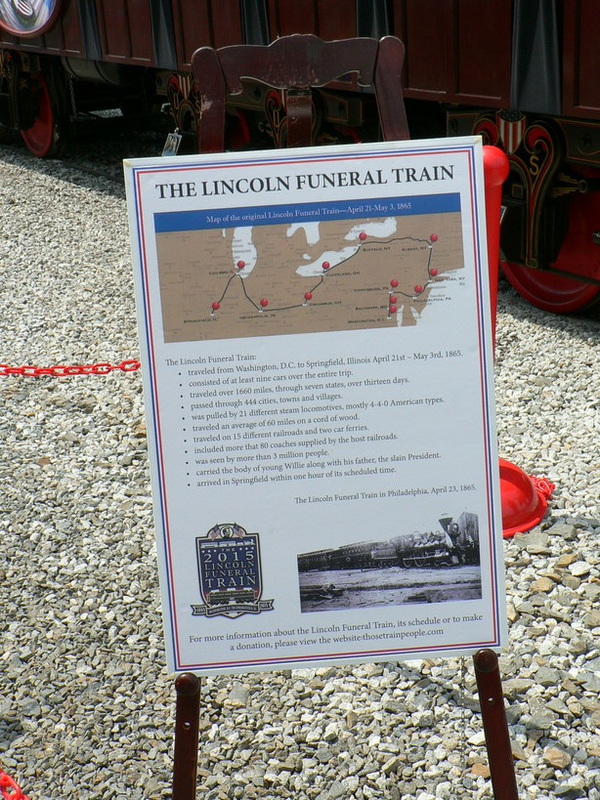 The 2015 Lincoln Funeral Train, organized by the Historic Railroad Equipment Association, is a touring event to mark the sesquicentennial of President Lincoln’s death and funeral. Fixtures in the traveling tour are the 4-4-0 “Leviathan” locomotive and a replica of the Lincoln funeral car. As each location can supplement the event, the North Carolina Transportation Museum at Spencer (henceforth the NCTM) included re-enactors (soldiers and civilians), horses, a funeral hearse, and camp life displays. 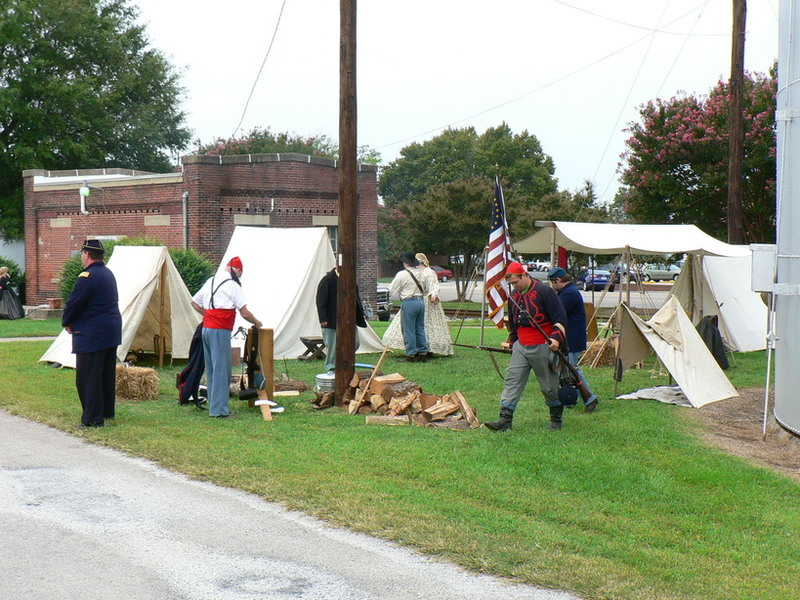 Added programs in the event included a small cannonade, a funeral procession, and a Lincoln lantern tour. I attended the event on August 29, 2015 but did not witness the entire program. 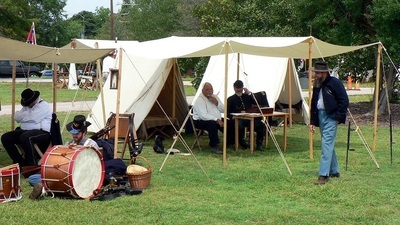 While the presence of the Lincoln funeral car replica and the Leviathan were assuredly historic, it was the addition of the reenactment soldiers that enhanced the event with the period Civil War atmosphere. 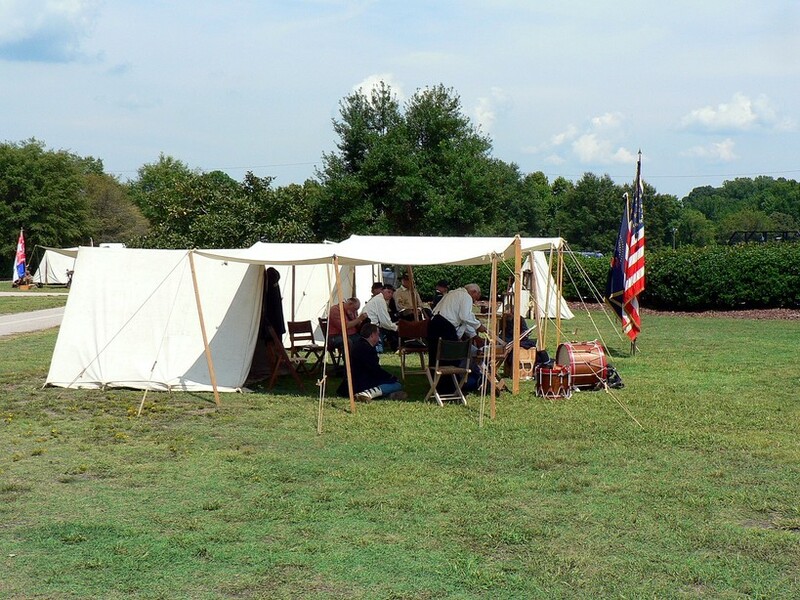 The soldiers added a measure of life and perspective which in turn, created a realistic complement to the event. Although Union army reenactors were obviously more prevalent with a Lincoln theme, Confederate soldiers were included at the event which made perfect sense since it was a southern venue. 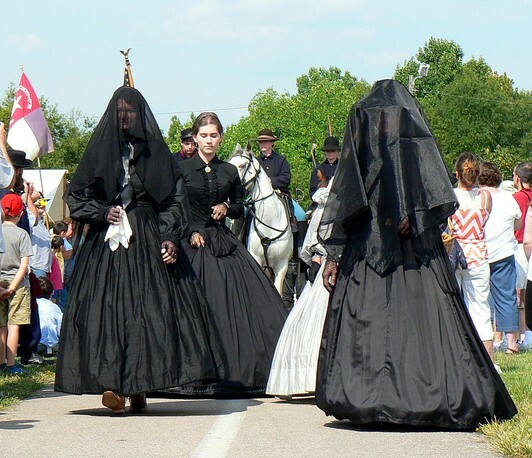 The Confederate troops did not participate in the funeral procession---as one would expect--- but their presence at the event nevertheless enlivened the historic aura. Photographing the event with any semblance of an authentic setting was futile. Simply because of the environment at the NCTM, it was impossible to capture scenes that are not inundated with visuals of the 21st century. The reader will notice trains, buildings and automobiles that are obviously anachronistic for the era as well as people in contemporary attire. It will require "viewers license" while observing the images and to imagine that what is out of place is not really there. 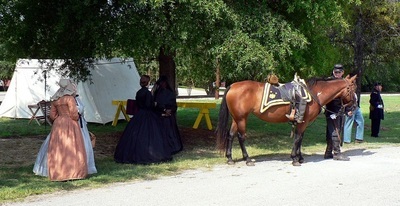 Below are a galleries of images taken during the Lincoln Funeral Train event at the NCTM on August 29. 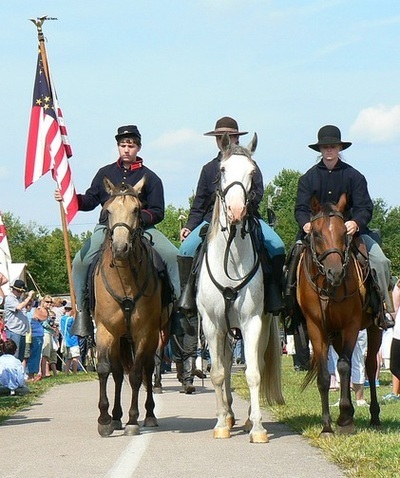 This commemoration occurred with less fanfare than recent events at the NCTM—in fact, there was an air of solace if not historical understanding of a tragic event that forever changed the course of American history. 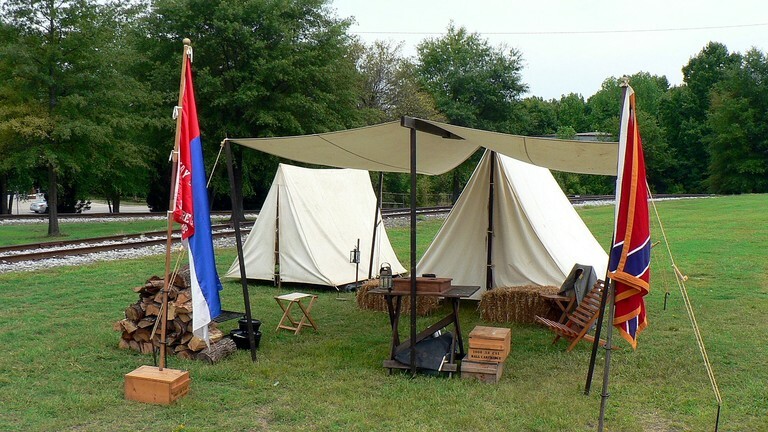 It beckoned to the individual that is both a student of Civil War era history and an admirer of railroads. As for the presentation, it was dispersed across the NCTM grounds although with a touch of choreography at planned intervals. In retrospect, it was easier to absorb the individual components rather than the sum of all. 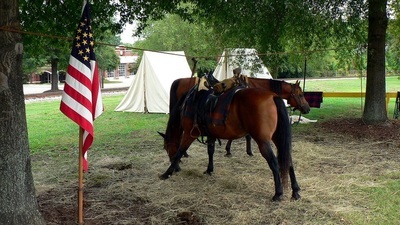 The camp scenes added realism to the Lincoln Funeral Train event in conjunction with the soldiers. It gave a glimpse of camp "life" when the reenactors were not participating in any of the event programs. When not busy, the soldiers gathered at these camps duplicating on a small scale exactly what occurred during the war. 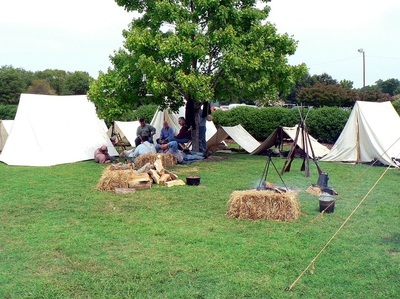 Attendees could freely walk among the tents and speak with the participants while they were idle. All were happy to speak and to answer any questions. 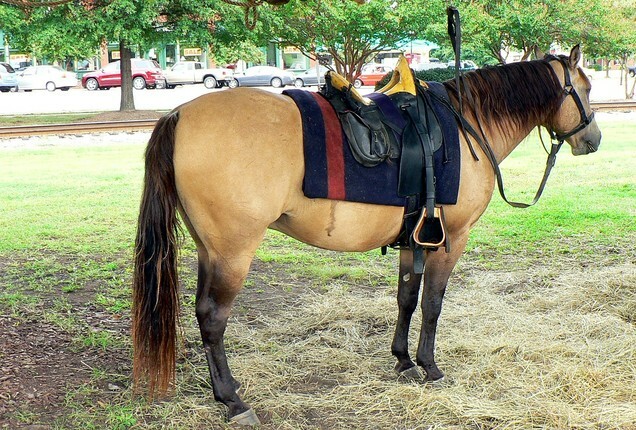 More so than any of God's other creatures, the horse has fulfilled the needs of man throughout the eons. Until the age of mechanization, they were the beasts of burden, the means of transportation, a direct bond between man and his daily tasks. Powerful yet stoic, no other animal possesses the majesty and gallantry of the horse. 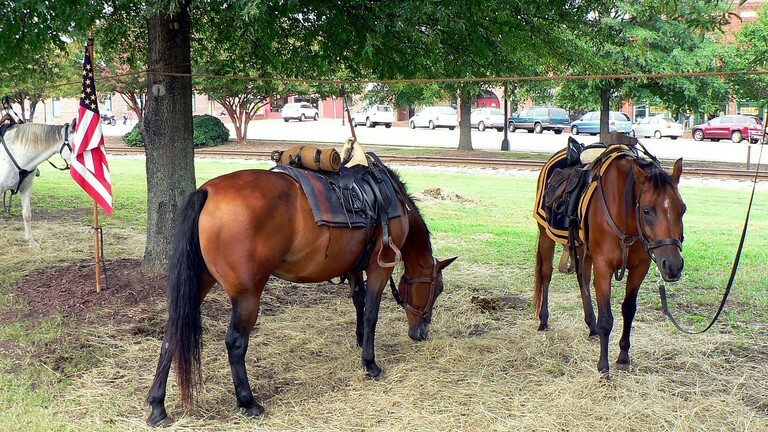 They were the unsung heroes of warfare---the steed of the cavalry, transporters of artillery and supplies----that were in harm's way just as any soldier. 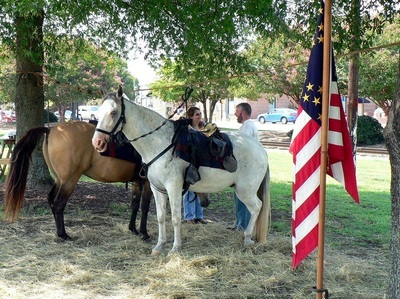 What would a commemoration such as this be without horses? Substantially less as these magnificent animals were such an integral part of life during the era. 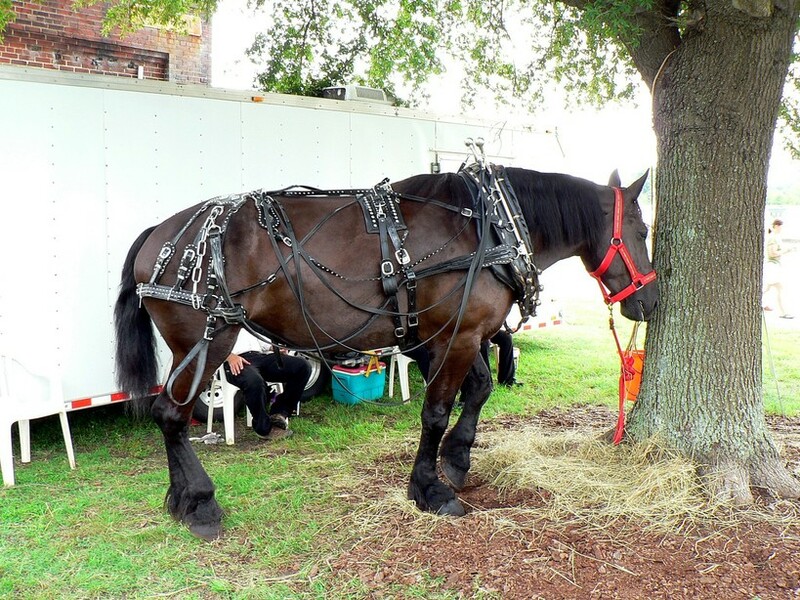 The horses at this event were obviously well manicured as the images attest and were graceful in their roles or just simply as tied down. They were a huge attraction for the visitors between events---quite tame as numbers of people touched, fed hay, and had photos taken with them. 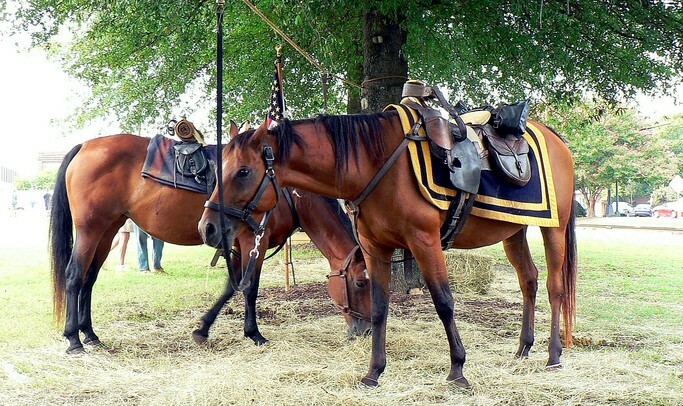 There is a stateliness about horses that takes on an air of regality in regards to the military. Beauty and grace define the Leviathan as seen in this side profile. No better name could have been given the 4-4-0 wheel arrangement--"American". 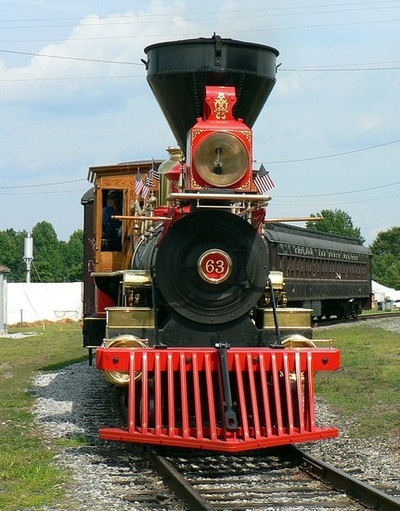 This class of locomotive literally built the country extending into the Industrial Revolution. Image Matt Robie 2015. The "Leviathan" is reminiscent of the period in American history of an evolving nation. The Civil War, in a basic sense, was a concurrent event in that was both a regression and progression--destruction coexisted with expansion. 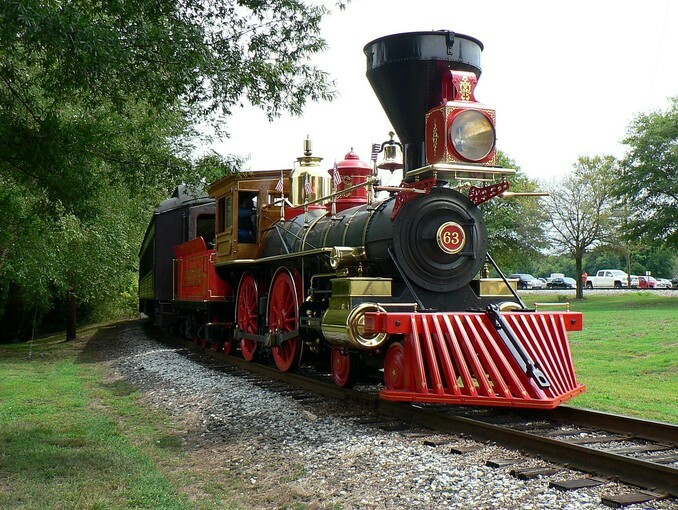 This locomotive itself represents a time of craftsmanship and functionality---many of its counterparts of the same fashion---lavish, decorative and with an individuality that merited a name. 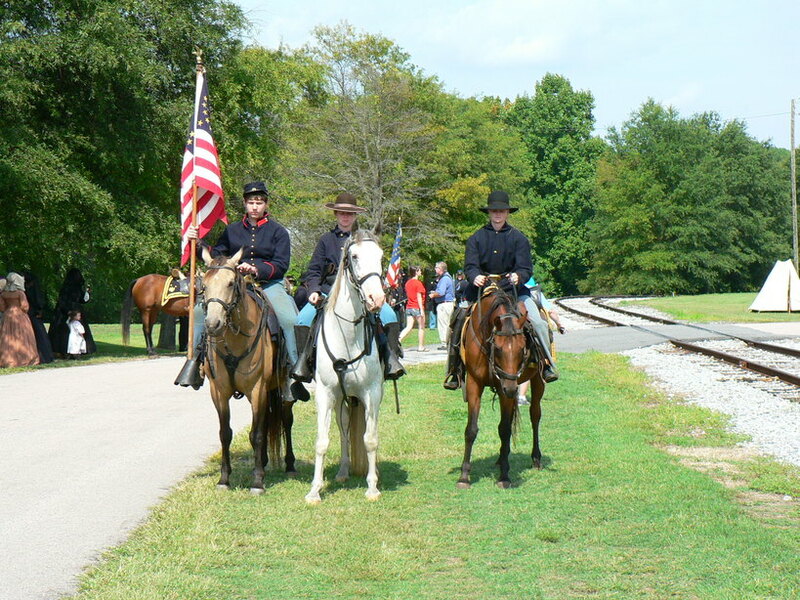 As it would be, the Civil War years marked the emergence of the railroad on a wide scale--in the decades that followed, the iron horse became the symbol for a reunited and industrial America. It is the fortunate individual who can manifest a dream into reality. Such is the case with David H. Kloke, founder of Kloke Construction Company and the Kloke Locomotive Works, LLC. 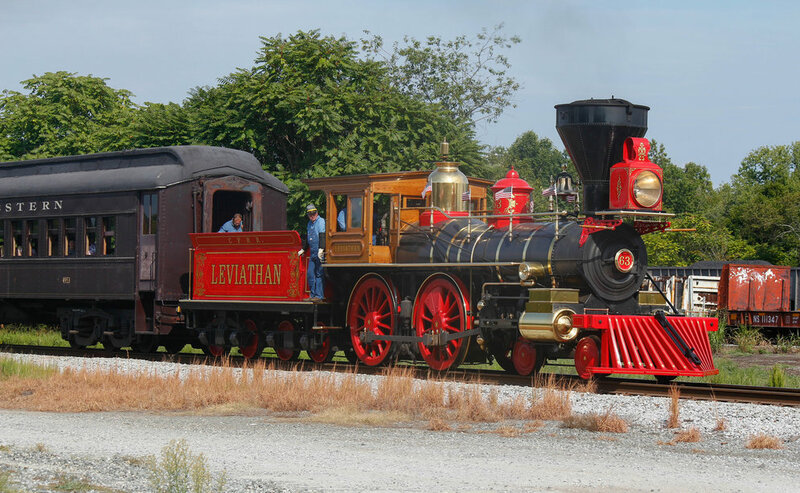 His dream was the create a replica of the “Leviathan 63” based on the actual model ordered by the Central Pacific Railroad in 1869 and was among the group of locomotives in service when the transcontinental railroad was completed later in the year. The replica Leviathan was a 10 year project commenced in 1999 and finished in 2009. It received its baptism of fire---literally—at the Owosso, Michigan steam festival that same year. 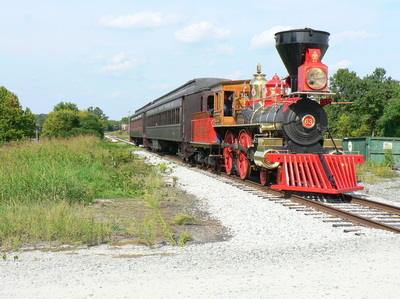 After participating in various events over the course of a few years, the locomotive was commissioned to “star” in the sesquicentennial Lincoln Funeral Train commemoration in 2015. 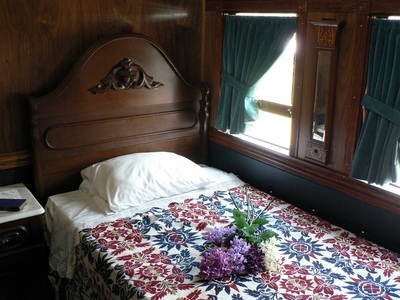 It is an excellent choice both aesthetically and historically. The Leviathan is transported to each individual location by truck. It is then unloaded and positioned on the track for operation at the festival site. Vividly colored in red and gold trim, this 4-4-0 American is beautifully ornate and it is fueled by recycled oil. Mr. Kloke notes that oil is the fuel of choice because wood is impractical and coal more expensive. The need for maintenance and cleaning is also lessened by using this type of fuel. During the weekend event, the Leviathan was utilized as the NCTM excursion power in keeping with the period theme. It pulled two coaches at scheduled intervals in conjunction with the program. Built for Lincoln in life during his Presidency, it was the epitome of 1860s rail travel. 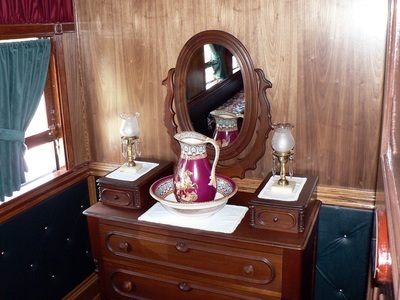 Beautifully ornate for the Chief Executive, it was luxury on wheels. But the modest and austere side of Lincoln shunned it and he never once traveled in it during his term. It is then ironic that Lincoln, in context of character, would be immersed with opulence in death. The railcar and the omnipresence of a lavish funeral tour likely would have appalled him had he known. 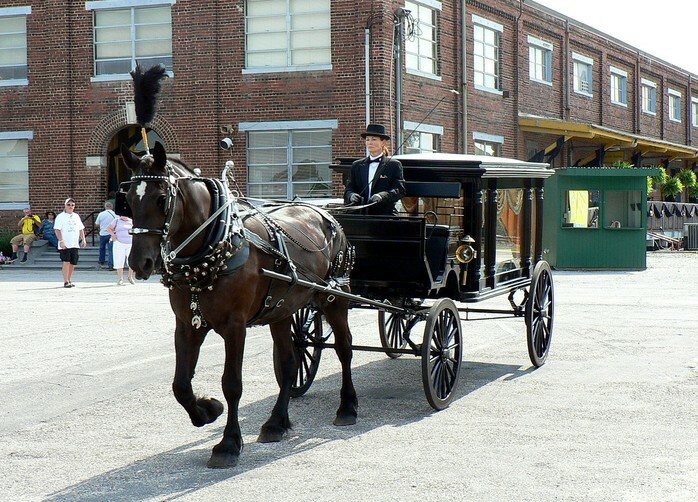 The original Lincoln funeral car remained in existence until 1911. It was privately purchased with the intent of restoration by the owner and was stored in Minnesota. Unfortunately, this car was destroyed when a prairie fire spread into the yard and consumed it. A tragic loss for history. 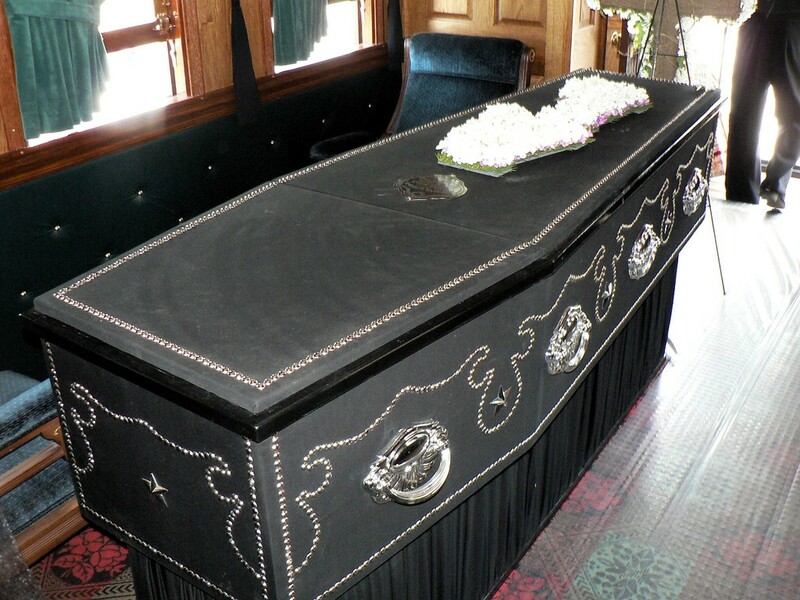 Just as with the Leviathan, the Lincoln funeral car replica is craftsmanship at its finest authentically detailed to the nth degree. 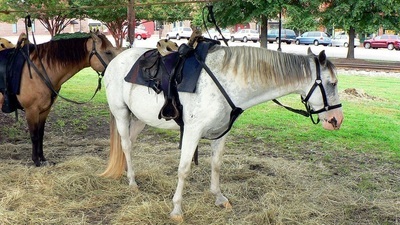 It, too, is transported on a specially designed trailer as it is trucked between destinations. 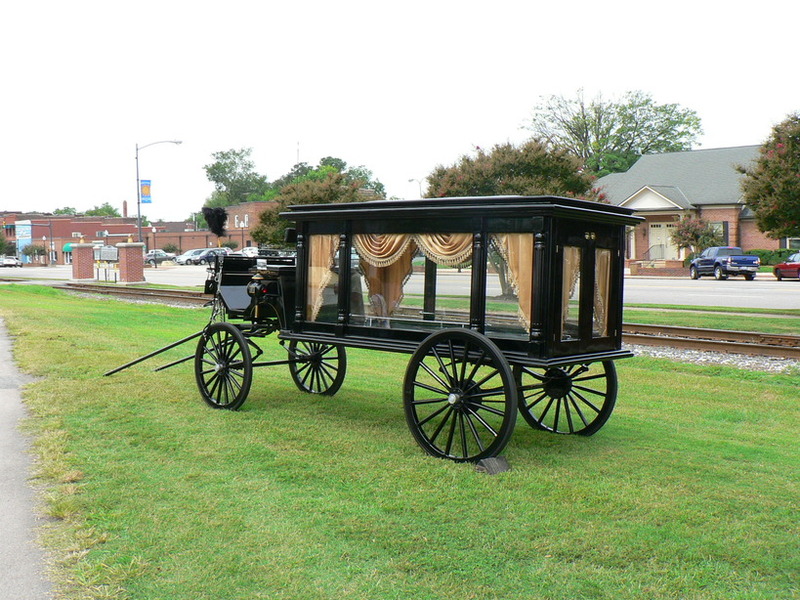 The trucks are removed during transport and the bottom of the funeral car rides directly on the trailer. The car is literal hand crafted art from its design, intricately designed trucks, and lavish interior. It is presidential in all respects---stately in 2015 just as it was during Lincoln's term. 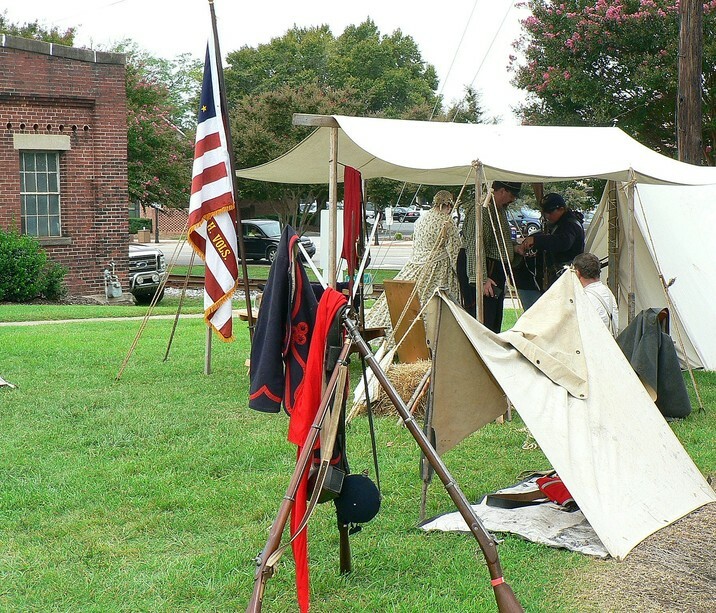 On the grounds of the NCTM, it was positioned adjacent to the roundhouse far removed from the outer reaches of the museum. 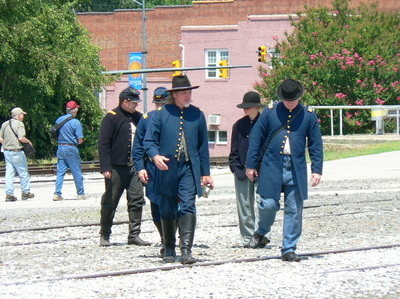 It remained stationary except for a posed photograph on the roundhouse turntable with the Union troops. 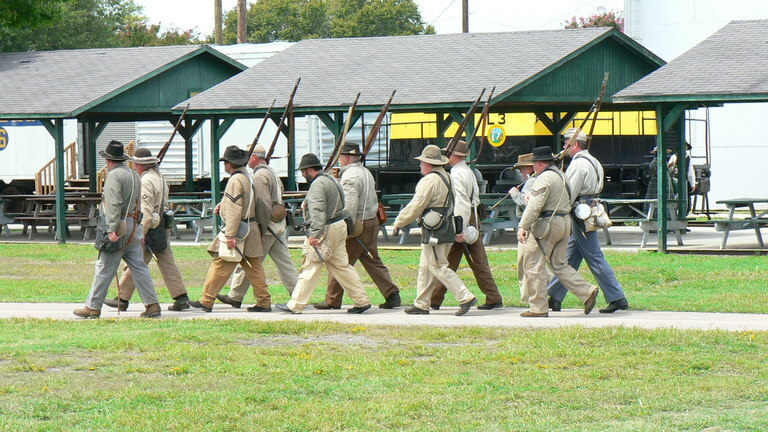 As the primary attraction for the event, a long line of people waited in line to enter the car. Movement was slow as it took time to pass through its tight confines as many visitors photographed the interior. 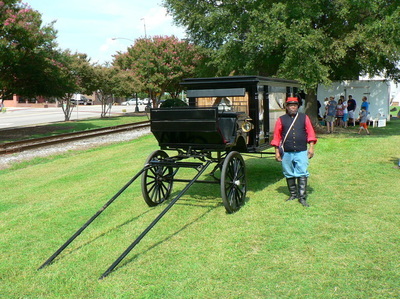 While in line, a chaperone dressed as a carpetbagger described the exterior of the car and answered questions. 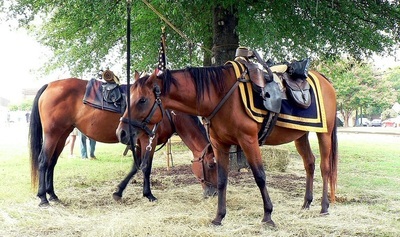 An honor guard flanked both ends adding to the stately disposition of its display. The eye was drawn to the black bunting which adorned the bottom of the windows and the large "United States" plaque graced with an eagle. But standing out on the exterior were the beautifully crafted trucks----the wheel sets painted red with and customized journals with "US" and eagles. 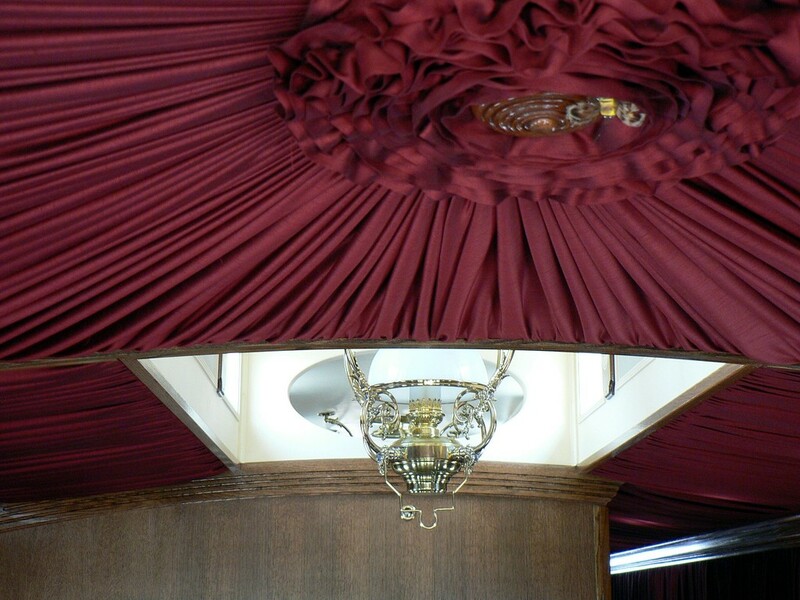 Once inside, the interior décor was resplendent in 1860s regalia. 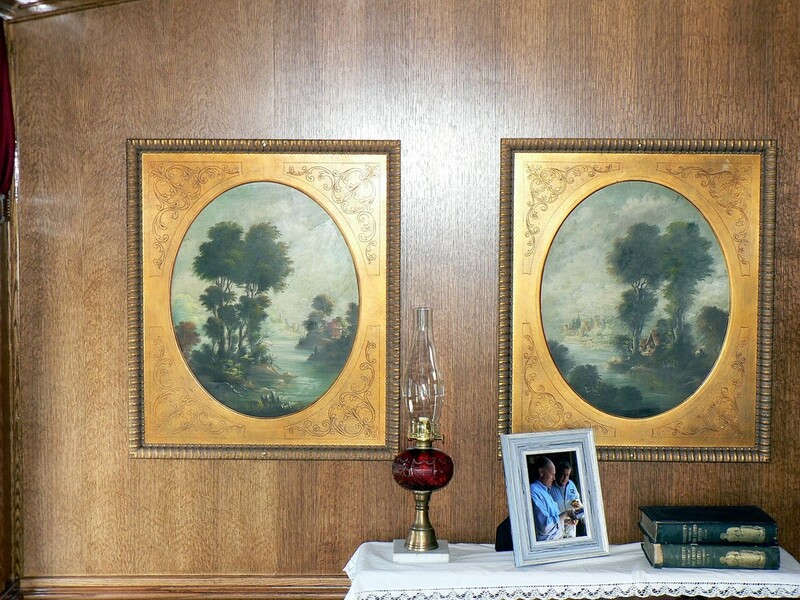 The wood paneled walls trimmed with green and the intricate woodwork highlighted the windows and trim. A bedroom and parlor decorated with period furnishings that complemented the scene again representing the era. Another section of the car originally designed for additional parlor or guest space contained the replica of the Lincoln casket. Itself an exact replica, one could get the feel of how onlookers viewed and paid tribute to the fallen President a century and a half ago. As the visitors viewed and passed the casket, some gazed upon it as if to pay respects in a symbolic moment. A chaperone was stationed here talking to the procession of people as they passed through. As a side note, Bob Robertson is the Union soldier in the photos above--posed outside the car and paying respects to the casket inside--is a colleague of mine. 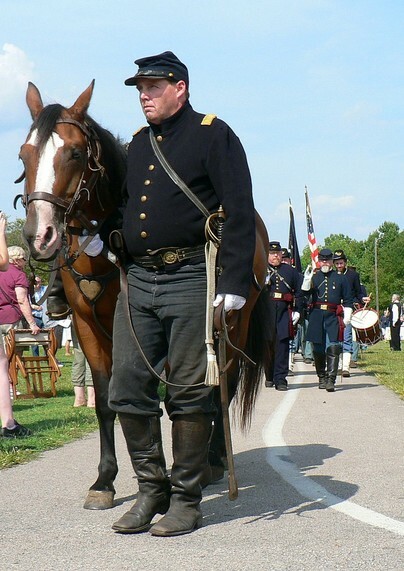 He actively participates in Civil War reenactments and the Lincoln Funeral Train event was yet another opportunity for him to do so. There is an air of somberness while engaged in any endeavor regarding the Civil War. Whether it is a book, a movie, a battlefield, or a reenactment--- a century and a half later, it tugs at the soul. 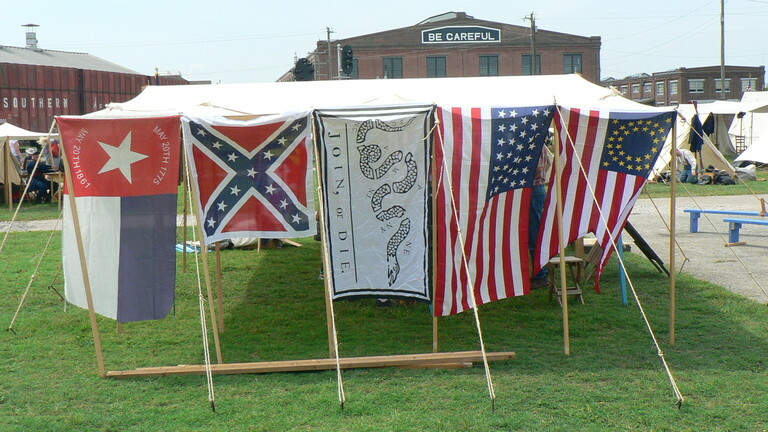 At its root it was the great American paradox replete with ironies. It was a divided country at war with itself subjugating all with an immeasurable suffering. 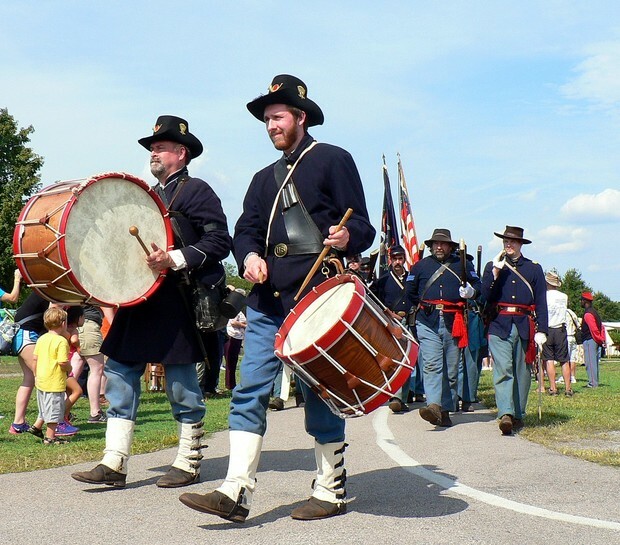 Whether walking the ground of Marye's Heights at Fredericksburg, the slope of Cemetery Ridge at Gettysburg, or watching the reenactment of the funeral procession at the NCTM—there is an energy present that defies the ripples of time and rational explanation. 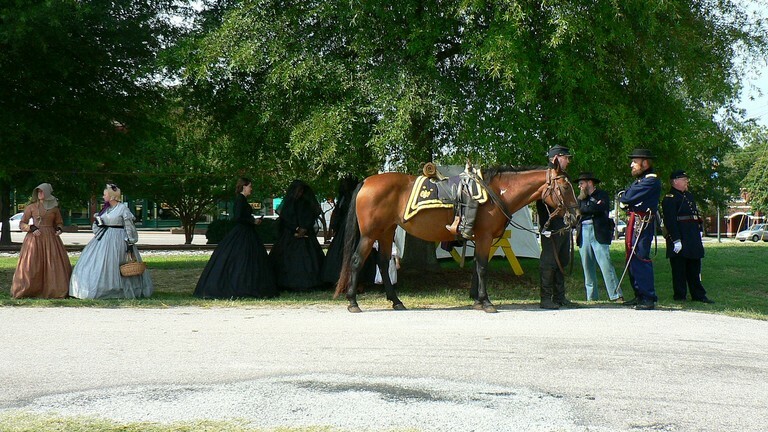 Even on a small scale, the funeral procession at the NCTM cast an air of melancholy as it passed the crowd of onlookers. The officers led the way followed by the hearse passing slowly with its horse in cadence with the soldiers. Trailing the hearse were the women mourners in a pall of black and behind them, the honor guard then the drummers with the soldiers in procession. 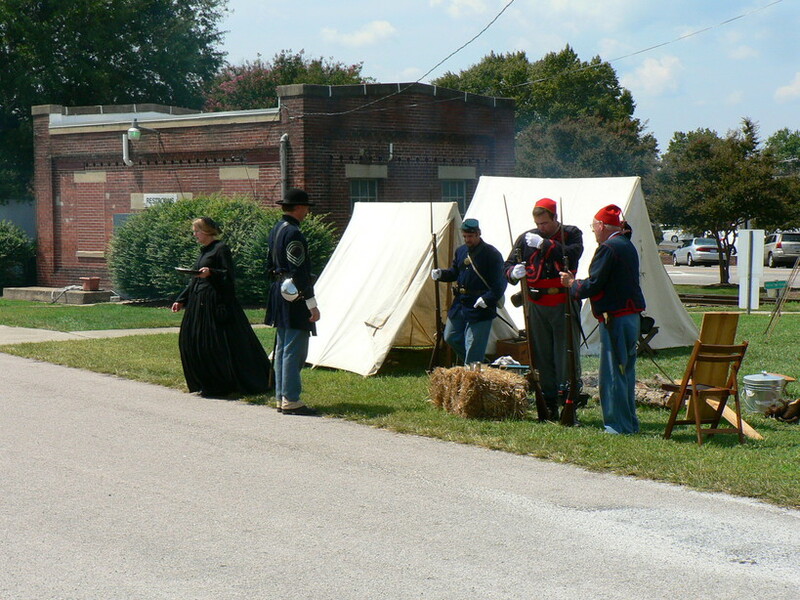 At the conclusion of the procession, the participants dispersed and visitors could freely mingle about conversing with the reenactors. Among the questions asked were “are the guns real”, “are the uniforms hot”, and “how long have you been a reenactor”. In summary, nearly all of the visitors were appreciative of the event and the interaction with the participants. The actual processions in 1865 that took place during Lincoln’s funeral were surely a spectacle to the senses. Masses of troops in formation marching along the streets of Washington, New York, and other cities along the route left a lifetime of memories for those who bore witness. Photographs taken of these processions offer a glimpse of the grandeur but certainly cannot attest to the atmosphere that accompanied them. It undoubtedly was grandiose yet saddened by the circumstances. 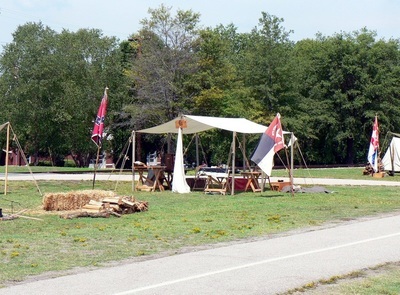 Aside from the events taking place, various displays and scenes could be found on the NCTM grounds. Among them as depicted in the images above, flags from the Civil War period, both Union and Confederate, as well Revolutionary era. A book with Leviathan photos and a framed image of Lincoln were positioned outside the funeral car. A larger display sign depicting the route of the funeral train was also visible at the Lincoln funeral car replica. 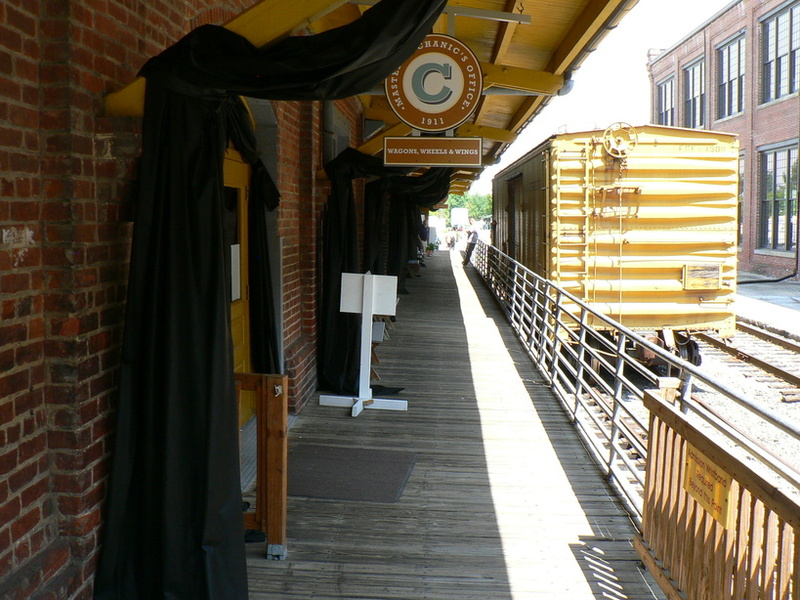 Black bunting was displayed along the NCTM gift shop building and offices as seen along the walkway passage. 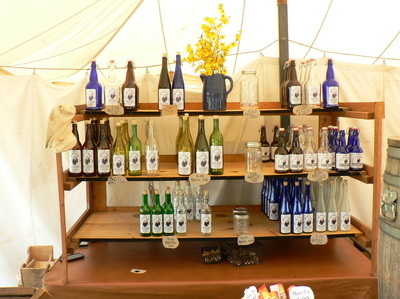 In addition, several tents were on site that contained period items such as the bottled drinks as shown. 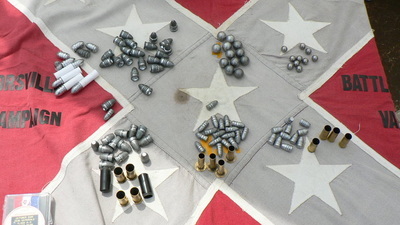 Civil War ammunition--replica moldings of actual shot--were also on display which included large and small caliber round shot and minie balls. This page is dedicated to the memory of my mother---she was an avid admirer of Lincoln and his life as well as a student of Civil War history. It is because of her that my own interest in both remains all these years later.